Castle House Weddings at Castle House01432 356321work Wedding Ceremony VenueCastle House is a beautiful boutique hotel and the most elegant venue for your Hereford wedding day. With a wedding licence for Civil Ceremonies, Castle House has capacity for 50 people, lovely gardens reached through French windows, ample space for a garden marquee, and a separate bar and lounge, the hotel is perfect for an intimate wedding day or civil partnership celebration for all Hereford weddings. At Castle House we guarantee immaculate service and will work with you from our first meeting until you leave in a shower of confetti to make sure your day runs like clockwork. We’d be delighted to show you around, talk about our bespoke wedding packages, and, of course. our Exclusive Use option so you and your guests can take over all 24 rooms for a wedding house party. Call us on 01432 356321 to arrange a meeting with our wedding coordinator. 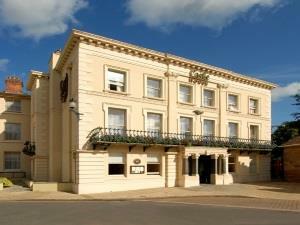 Castle House is a beautiful boutique hotel and the most elegant venue for your Hereford wedding day. Hereford has many one way streets so we will send you a map. Castle House faces down Castle Street to the Cathedral. Approach by the East Street or St. Owen's Street, Then St. Ethelbert Street, Castle House is at the end. Signposted from the Ring Road.